This Slow Carb Bean and Vegetable Omelet is a great way to start your day! It is perfect for a slow carb diet, and will keep you completely satisfied until lunchtime. You can modify this recipe in several ways, depending on what vegetables you have on hand. You really can't go wrong, and it's so simple to make! Please try my recipe, and leave a comment below if you would like to share any modifications you try. Preheat a large frying pan on medium heat, with a splash of olive oil to coat the surface. Dice the onion, and cook it 2-3 minutes, or until tender. Add the beans and the frozen vegetables. Season to taste with salt, pepper, and cumin. (Or, try adding your favorite spices, and then leave a comment below to share!) Stir well. Cook for a few minutes, until the vegetables have softened. In a separate small bowl, crack the two eggs and add the egg whites, and mix well. Add to the vegetable mix in the pan. Gently stir around to coat all the vegetables with egg mixture. Pry up the sides and let the egg run underneath to make the cooking go faster. When the egg has cooked, slide it halfway out of the pan on to a plate, and flip the second half over for a perfect omelet! You can make all sorts of modifications to this recipe, if you want. You could try adding a large handful of spinach to the vegetables, and cooking until it is wilted before adding the eggs. You could add a clove of garlic to the onions at the start if you're a fan of garlic. 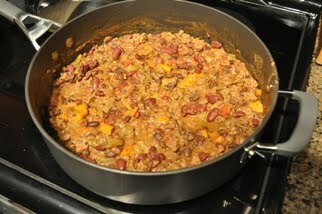 For an extra boost of protein, I have previously tossed in some leftover chicken pieces (diced), ground turkey, or ground beef for a fantastic added flavor. For non-slow carb people, you can add your choice of cheese to the top of the eggs prior to removing it from the pan and flipping it over. If you want to have more flavor you can increase the number of eggs you use or completely remove the egg whites. I love serving this up with a few spoonfuls of unsweetened medium salsa. You really can't go wrong with this recipe, and it won't leave you feeling stuffed or craving food anytime soon after! It's a great breakfast to power you up until lunchtime.